Tag Archive | "Sheff v. O’Neill"
HARTFORD — Having run out of time to comply with a court order to desegregate Hartford’s schools, the state has entered into a new agreement that will expand school choice opportunities for 2,523 more students. The new order — agreed to Tuesday by the Connecticut Attorney General and the plaintiffs in the state’s landmark Sheff vs. O’Neill supreme court decision — requires the state to pay to open four new magnet schools, offer more Hartford students seats in vocational-technical high schools and send more children to suburban schools. “For all the children that have benefited, this is terrific,” Superior Court Judge Marshall Berger said before signing off on the one-year agreement. The state has spent billions to open integrated schools since the state Supreme Court ordered the state nearly 20 years ago to eliminate the inequities caused by segregating students. But despite these efforts, the state has routinely fallen short of the benchmarks they have agreed upon. This school year, 37 percent of Hartford’s students are attending integrated schools — 4 percentage points shy of the number the state agreed to reach in a settlement five years ago. Addressing the court before the new one-year agreement was approved, the mother responsible for successfully suing the state nearly 20 years ago on behalf of her son told the court she is growing impatient for parents with children still in school. “I am the person in the street that parents go to and say, ‘I didn’t get into a magnet school,'” Elizabeth Horton Sheff said. “We are making progress. We are not there,” she said. Sheff’s son, Milo, was 10 when she filed the lawsuit against the state. He’s now 34 years old. The cost of expanding school choice opportunities is expected to cost the state $6 million in the fiscal year that begin July 1. Asked about a provision in the new agreement that allows the plaintiffs to come back to court if that funding is not appropriated by the General Assembly, an assistant attorney general said no funding has yet been secured from the legislature. “There remain challenges, your honor,” Assistant Attorney General Ralph Urban responded. Education Commissioner Stephan Pryor has proposed a variety of initiatives to expand school choice, many of which cost much more than $6 million. Pryor said Tuesday that it is important this new agreement did not divert money away from the needy Hartford schools. It’s unclear what happens if the state meets the requirements outlined in the agreement that 41 percent of Hartford students be attending integrated schools or that 80 percent of those who wish to leave their neighborhood school be provided the opportunity to do so. 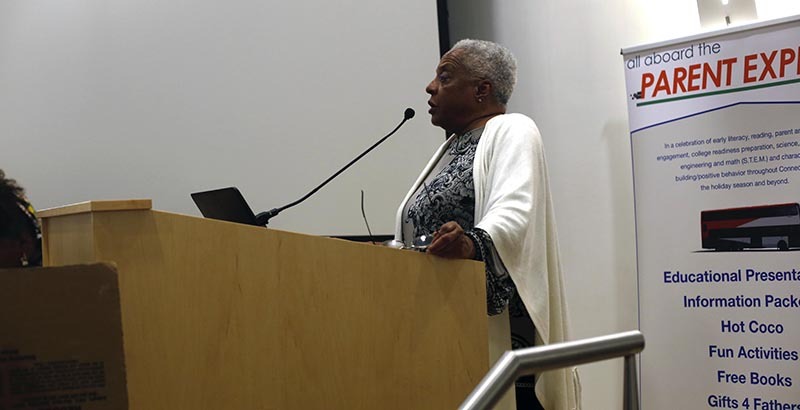 Martha Stone, the lawyer for the plaintiffs, said she expects the state to enter into a new three- to five-year year agreement to further desegregate the schools beyond 41 percent. However, the attorney general’s office feels differently. Whether the state would remain under a court order to desegregate after next year is “up for discussion at this point,” Urban said. Read details of the new schools and the agreement here. This article was first published by ctmirror.org Photo Credit: ctmirror.org (Elizabeth Horton Sheff (center) leafs through the new agreement). HARTFORD — The Hartford Board of Education on Tuesday approved proposals to open two new Sheff Magnet schools and expand the Betances STEM Magnet School at a larger space downtown. Tuesday’s votes immediately activate the process for developing an operations plan for all three schools, school officials said. Under the first measure, the board accepted a grant of $600,000 from the state Department of Education to find a new location for the Betances STEM Magnet School to accommodate an expanded student body of 4th-through-8th graders by the beginning of the 2013-2014 school year. The second item approved by the board would convert the current Montessori program at Moylan Elementary into a magnet school housing 84 Hartford students and 63 suburban students. Moreover, it creates a new Hartford Pre-K Magnet School for 180 children of ages 3 and 4 also by the beginning of the 2013-2014 school year. Both proposals were made possible under the terms of the new one-year negotiated agreement between the State Department of Education and the plaintiffs to the Sheff vs. O’Neil lawsuit. With the addition of the Montessori program at Moylan and the Hartford Pre-K Magnet School, Hartford Public Schools will now be home to 17 magnet schools, seven of which specialize in STEM (Science, Technology, Engineering and Math) education. The district’s portfolio also includes a number of themed schools such as, the Renzulli Gifted and Talented Academy, the Hartford Insurance and Finance Academy (High School, Inc.), the Hartford Nursing Academy, the Hartford Law & Government Academy, the Hartford Journalism & Media Academy and the Hartford Academy of Culinary Arts. HARTFORD — In an effort to meet a school desegregation mandate, the state Department of Education will hold another school choice lottery to fill 500 seats in Greater Hartford magnet schools. The deadline to submit application is May 25. State officials said families in Hartford, Bloomfield, Manchester and Enfield should send applications to the Regional School Choice Office at 165 Capitol Ave. in Room 270. For more information or to download an applications visit www.choiceeducation.org. The discussion will be on Thursday, July 28 from 12: 10 to 1: 50 p.m. at the Downtown Hartford Public Library’s Café Space. The book talk is a part of the library’s Novel Destinations, a summer reading program for adults. Participants borrow books, audio books, and magazines, read them, and then complete and submit an entry card for each item read. The more someone reads the more chances that person has a chance to win prizes. Over the summer, area authors, including Adams, will read from and discuss their books, or upcoming books, on Thursdays, June 30 through August 25, from 12:10-12:50 p.m., at the Downtown Branch, in the Café Space on the Main Floor. Attendees are invited to bring their lunches and the Library will provide beverages. Each time that someone attends, he/she will receive an entry for the Library’s adult summer reading program, Novel Destinations, prize drawing. Dr. Adams is a postdoctoral associate at Rutgers University’s Center for Historical Analysis. She teaches Twentieth Century U.S. history. NORWICH — Historian Dr. Ann-Marie Adams will present a Women’s History program at Otis Library on March 10. The event will include a talk distilled from her dissertation while at Howard University. Her dissertation, Sheff v. O’Neill: The Troubled Legacy of School Segregation in Connecticut, was published in 2010 and is the first detailed scholarship that examines the history of blacks in Connecticut from colonial period to the 1990s. The program, “Sarah Harris: Courage and Commitment in the Quest for ‘a little more’ Education” will begin at 6 p.m. Her talk on Thursday will detail Prudence Crandall’s fight against the prevailing racist sentiment of antebellum Connecticut after she opened the first school for black women in 1833. Crandall’s courage is heralded across the nation and inspired a museum in Canterbury, Conn. But the courageous act of Sarah Harris is rarely examined, or heralded in public, Adams said. In her presentation, the journalist and historian will discuss the role of Harris, the young black girl who dared to ask for a “little more” education in the ongoing quest for citizenship. Adams’ presentation is also the first to examine race, gender and class in antebellum Connecticut and the complex but simple relationship between two women: Crandall and Harris. For more information, please call (860) 889-2365, ext. 128. HARTFORD — For many city residents, the idea of the school desegregation case, Sheff v. O’Neill, is simply that–an idea. The idea is that thier children can learn only “if they sit next to a white child,” according to one parent. In an effort to clarify the goals of Sheff, the state department, as mandated by the court, will open an information center on Friday at the Wilson Gray YMCA Center on Albany Avenue. State officials said this effort is to help meet the demand of the court mandated Sheff. At 2:3 0 p.m., State Education Commissioner Mark K. McQuillan and Hyacinth Douglas-Bailey, Vice President of the Greater Hartford YMCA, will sign an agreement designating the Wilson-Gray YMCA as the first of several community centers that will help families with information and registration materials for students from throughout the region to enroll in a variety of public school choices. In1996, the Court ruled that Hartford students must have access to quality educational programs in settings that are not racially or economically isolated. The Greater Hartford Regional School Choice Office (RSCO) was established to provide opportunities for both urban and suburban students to attend schools outside their school districts in order to increase educational choices and reduce isolation. McQuillan and representatives of the participating agencies will discuss how parents can use the new centers to access additional educational choices in the greater Hartford region. Community volunteers will be on hand to demonstrate the online resources that the RSCO is developing for use in more than a dozen planned satellite sites in Hartford and in the greater Hartford area. The Commissioner and RSCO officials will also detail other efforts to reach out to parents in Hartford and the region and to make available information and assistance in applying for the Greater Hartford Regional Choice Program, interdistrict magnet schools and programs, the technical high schools and an agriscience center. Seven school “choice fairs” are planned to provide families in Hartford and from all over the Greater Hartford region the ability to obtain information from the Regional School Choice Office and its partners from each magnet school and become more informed. It was a noble plan: screen the latest film about America’s failing schools and hope to spark meaningful dialogue in Hartford, Connecticut, home of the nation’s widest academic achievement gap. Last Wednesday at Bow Tie Cinemas in Hartford, that plan failed. During the almost two-hour screening of the gut-wrenching documentary, Waiting For Superman, the audience winced, sighed and cried as they watched on screen five families (four are working-class black and Latino. One is white and middle-class) struggle for access to quality education for their children. Except for a few announcements afterward, the audience remained reticent about a film that had received plenty of media buzz. Education advocates will not give up, however. In the coming months, other reform-minded individuals and groups in Connecticut will use this film as a catalyst for conversations about the lack of progress to fix Connecticut’s failing schools and to eliminate the achievement gap, a catch phrase lobbed around to describe the fact that some students’ national test scores are low and others are not; that more than 50 percent of students in some school districts drop out of high school and even fewer go on to four-year colleges. Education advocates are also mindful that the storyline in Superman is not new. After watching the film, some parents became frustrated. It didn’t take long for them to realize the documentary was an old story repackaged as something new. When pressed for comments about what they had seen in the film, the audience sat in awkward silence. Minutes later, one woman from Waterbury punctured that silence. And she was blunt. They talked around it, though. But there was no discussion about what exactly the problem is. And although Davis Guggenheim’s documentary zeroes in on the political underpinnings of America’s public educational system, it presents an ahistorical view of contemporary poor, black and brown students fighting for quality education. Davis’s documentary presented the story as though those children’s troubled situation popped up in 2010. However, the reform-minded filmmaker concluded that the issue is complex and the powerful teacher’s union is at the crux of the problem. He might be true. But the lingering problem is that the filmmaker puts that problem in a vacuum and apparently has forgotten that past is prologue. That’s because America has a history of not educating some of its students; that less than 50 years ago, there were vicious verbal and physical attacks on those who tried to integrate schools after the Supreme Court decided in 1954 that separate schools were unequal and therefore unconstitutional; that immediately there was white flight from city schools after some states implemented the first phase of the Brown remedies. More than 50 years after the Brown decision, Connecticut has New England’s only ongoing school desegregation case because the state is moving with deliberate speed (translation: slow) to enforce court mandated remedies. Plaintiffs in Hartford’s 1996 Sheff v. O’Neill case will return to Court this month for a status conference about the implementation of the court-mandated remedies. Those remedial efforts—even though it would benefit all students—are moving at glacial speed, mostly because of a strong resistance to regionalism—a true solution that would give children access and choices to quality schools, many argue. But there’s a larger—and more insidious– issue at play. And it’s also an inconvenient truth: many people think some students cannot learn, especially students who are black and brown. This sentiment is undeniably the classic definition of racism. Embedded in this notion is that these students are intellectually inferior. And no matter which charter school pops up and produces all college-bound students, intellectual inferiority among these children will persist when they go on to college and enter the workforce. That’s because the idea that some people are inferior is deeply ingrained in the psyche of many white people—and increasingly some black and brown people—that not all students can learn. And there’s nothing soft about this kind of bigotry. Davis does not address the issues of the kind of race or bigotry displayed by that anonymous commentator, but he chooses instead to focus on the economic implications of this familiar American story about the ongoing struggle for quality education. In the coming weeks, there will be more forums and debates among whites who have ideas about how to create a solution for everyone, including the majority of black and brown students in “drop out factories.” This kind of paternalistic behavior in Connecticut continues to foster the belief that only whites can be Superman. The students get that. The adults get it, too. But most of them can only silently oppose this kind of showmanship displayed by top business and civic leaders in the area. And while we wait for individuals already in key positions to act decisively, Connecticut’s children continue to wait for Superman. Ann-Marie Adams is a Ph.D. Candidate at Howard University and is writing about the Sheff v. O’Neill lawsuit.